I put together a quick and dirty TEA N2 laser today. I told a friend I’d help him build an N2 from scratch this weekend so I just wanted to make sure I could do it once again. I picked up a new 60lb tank of nitrogen as my last tank was emptied some time ago. I had bought the bottle originally quite a while back so I only had to pay $33 exchange for the fill. Quite a deal considering how slow I go through nitrogen. The nitrogen is fed into the lasing channel with just a a piece of hose placed over the center of the bore. 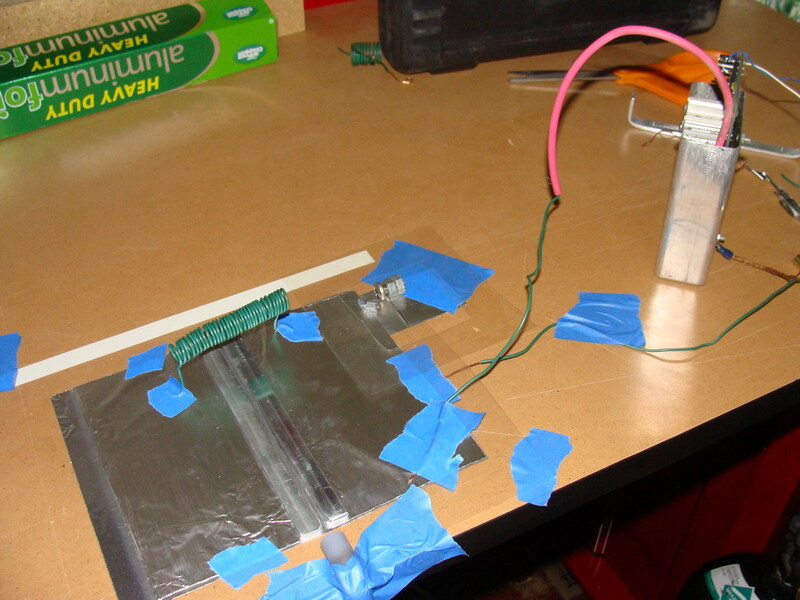 The nitrogen will flow down and around the electrodes. Perhaps it’s not a very elegant solution. A acrylic plate with a hole and hose fitting on it that sits over everything might perform a little better, but I don’t think it makes a big difference for this level of project. The electrodes are only about 6 inches long and are made from aluminum bar stock. I used a file to shape a rounded profile onto their edges and then 800-1000 grit sandpaper to smooth and metal polish for a final polish. It only took a few minutes to make the electrodes, they’re aren’t that great, but apparently are suitable. A lot of this is probably not something you woudl use on a final or project laser, but if you just want to see how fast you can make a nitrogen laser from junk around the house, it’s fine. The power supply for the laser is a ~18kV solid state monitor flyback I have had for years. The monitor I pulled it from had no standard flyback transformer and used only this box for the HV supply. 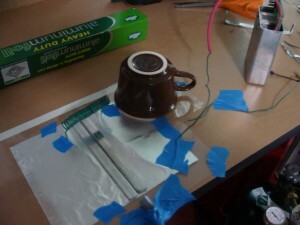 The box takes 24 volts from the power pins and puts out high voltage. It’s fairly low current but has worked well for experiments such as this laser and other low current high voltage applications. If I could find more of these it would be great, much more convenient than the traditional high voltage supplies one has to make and much smaller than a neon sign transformer. 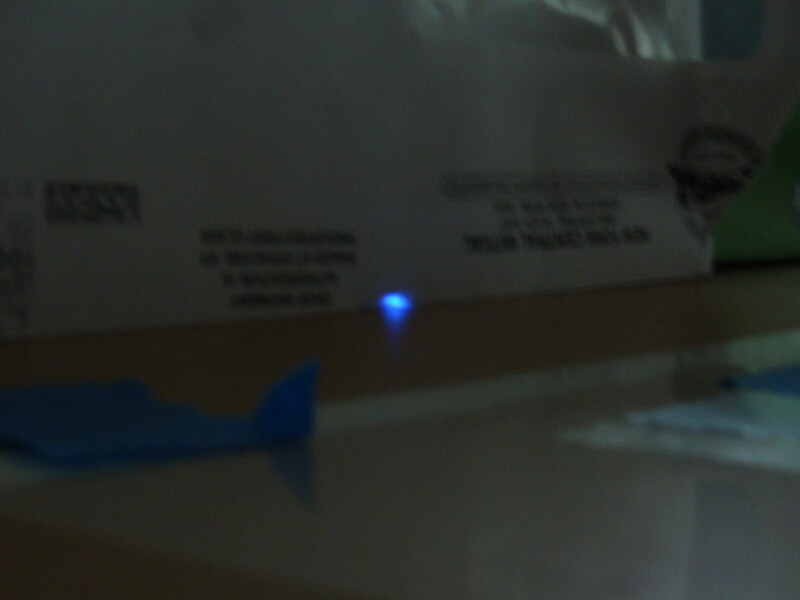 This whole laser is very low profile, so the output beam was just skimming the surface of the workbench. 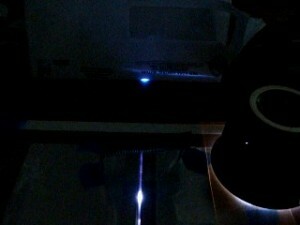 I tried to get a variety of shots of the laser operating for a good overview. The green fluorescence is from the dye of a highlighter type marker mixed with water. The orange fluorescent fluid is R6G I saved back when I scrapped an argon pumped dye laser assembly. Additionally here are a few still shots so you can see the layout.